BATTLE GROUND — Police officers and other public safety personnel arrive to work not knowing exactly what their shifts might hold; that is why they are so well trained and equipped. 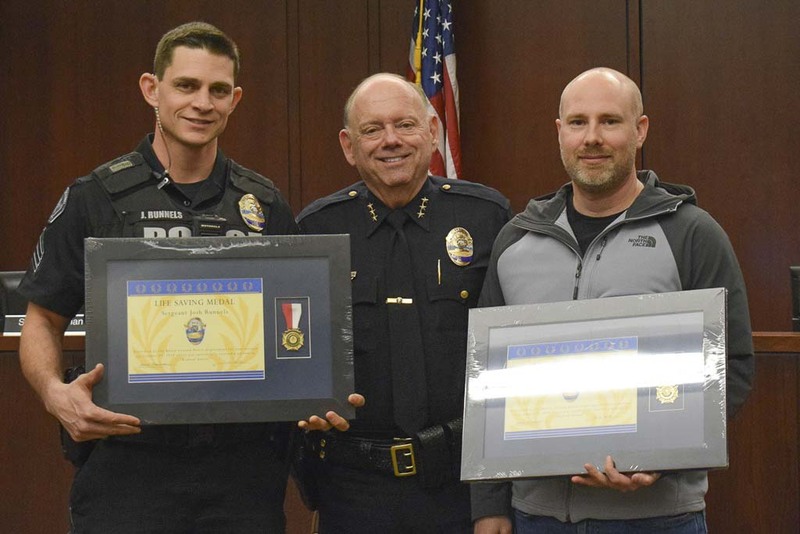 Battle Ground Police Sergeant Josh Runnels, Officer Kyle Kinnan and Officer Ed Michael counted on their skills, training and equipment to save the lives of two men during their recent shifts. They were recently recognized with the department’s Life Saving Medal. Sergeant Josh Runnels and Officer Kyle Kinnan were on duty when they were dispatched to a medical assistance call. Kinnan was first to arrive on scene, finding a young man, 19 years of age, unresponsive and seemingly not breathing. After assessing the situation, Kinnan determined the need to administer Narcan, a lifesaving medication designed to block opiate receptors, to the patient. He also administered chest compressions until Runnels arrived and took over the hands-only CPR. With the patient still unresponsive, Kinnan administered a second dose of Narcan. Fire District 3 emergency medical service personnel arrived, used an AED to find the patient had a pulse, and administered breathing assistance. The patient regained consciousness and was transported to the hospital. Battle Ground Police Officer Ed Michael received a call for AED assistance; reports indicated that a man had collapsed while jogging along SR 503. 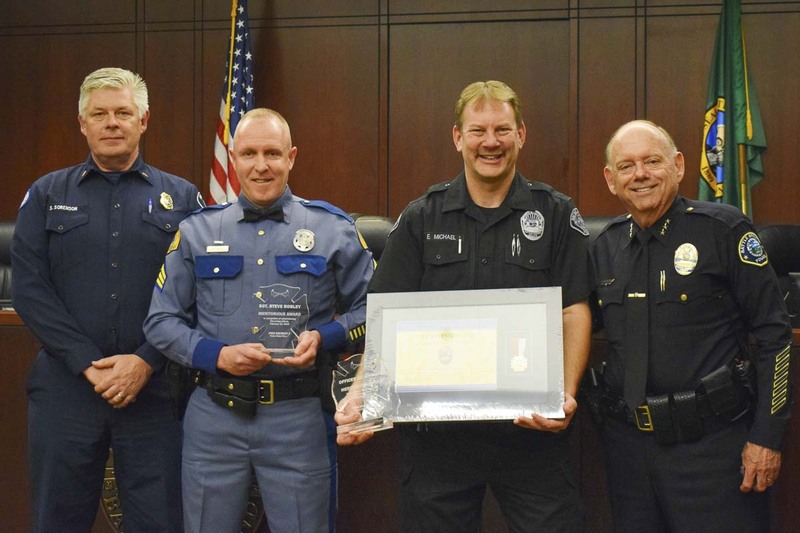 As he arrived at the scene, Michael found people gathered around the patient, one being off-duty Washington State Patrol Sergeant Stephen Robley, who was performing CPR. The patient was unconscious, did not appear to be breathing and did not have a detectable pulse. Michael applied the pads from his department-issued AED onto the patient’s chest. The AED advised that a shock be administered. Everyone cleared contact with the patient and Officer Michael administered the shock. Robley resumed CPR and the patient’s pulse was restored. Fire District 3 emergency medical personnel arrived on scene and took over CPR efforts. Michael and Robley continued to aid the patient by providing a report of care to the medical crew before patient was transported to the hospital. That patient, William Maxwell, survived. He appeared at the April 1 Battle Ground City Council meeting – just six weeks after the near-fatal medical incident — to thank Officer Michael and Sgt. Robley. Because of the their swift action, skilled observation and technical training, Michael and Robley, helped save William Maxwell’s life and were awarded their respective department’s Life Saving Medals and Fire District 3’s Life Saving Award.